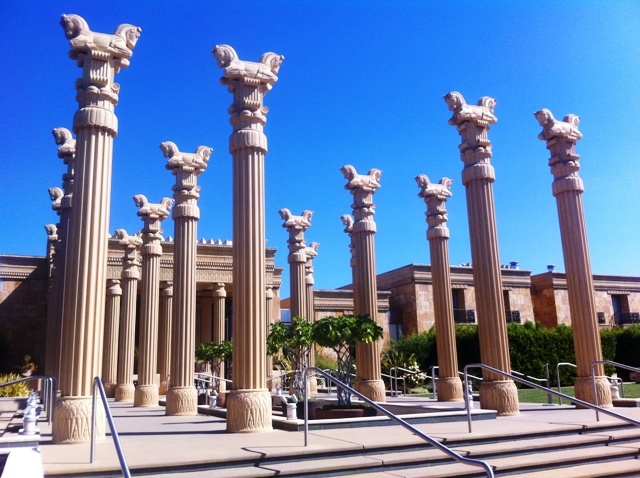 We finished at Caymus early and had a little time to kill so we decided to make an impromptu stop at Darioush Winery. 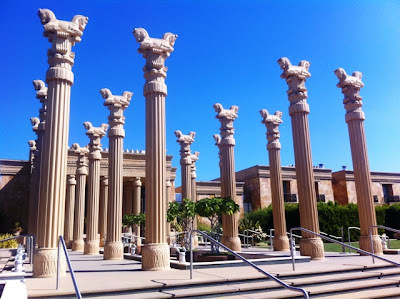 The architecture at Darioush Winery is Persian-inspired and definitely evoked feelings of grandeur as we walked up. As we entered the tasting room, its high ceiling created a very breezy atrium with walls lined with designer merchandise. 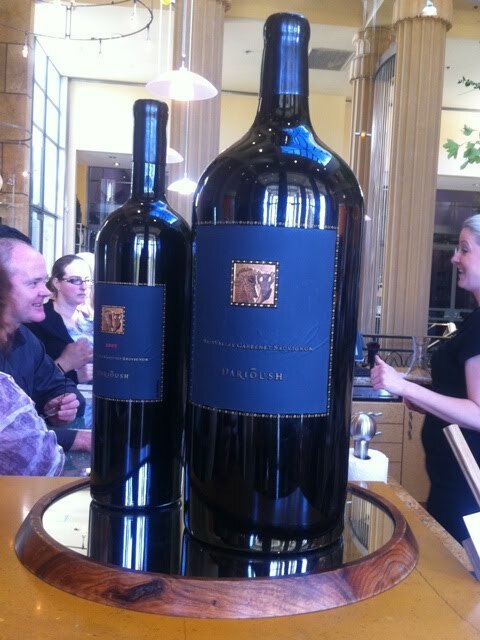 They also displayed a number of large magnum bottles with which we had a lot of fun taking pictures. The room was packed but we found a quiet corner to begin our wine tasting. 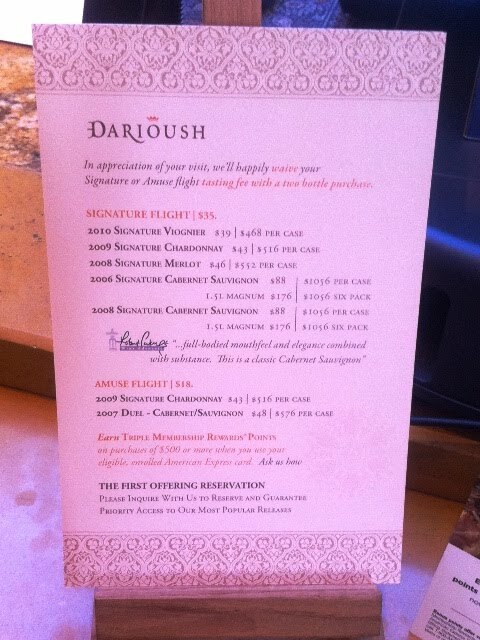 We selected their signature flight where you got to taste 5 wines for $35 (they also have an option of 2 for $18). It's a little on the pricey side for a tasting but if you buy two bottles, the tasting is comped which I thought was a nice touch. The three of us shared two tastings and it was just right for us (we've already been drinking and we knew we had a lot more coming up!) We started with the 2010 Signature Viognier ($39/bottle), followed by the 2009 Signature Chardonnay ($43/bottle) and the 2008 Signature Merlot ($46/bottle). They were all easy to drink, but unfortunately I didn't think any of them were that distinct or memorable. One could probably find similar wines for a much lower price. The last two flights were the Signature Cabernet Sauvignons, one from 2006 and the other from 2008 (both $88/bottle). The 2008 vintage, even though it was younger, was actually smoother than the 2006. Overall Darioush was a fun winery to visit. The architecture and space are cool to check out, especially for out-of-towners. The wines are pretty easy to drink but all of their wines are on the pricier side, and one can probably find similar wines at a lower price. colors and sizes at wholesale price.All are sale-priced with up to the minute styles associating apparels including designer uniting adorn, beach wedding dresses, marriage gowns, bridesmaids dresses, prom outfits, bloom skirt dresses & shelter dresses.Even we can accommodate the services of open vastness customization and loose plus gauge Purchase affordable stunning compound dresses now!lift avid shopping, accouter to the letter destined for the tremendous wedding ceremony with the facilitate of G-marry bridal. lots uρ fast! What host are yοu the usagе of? Can I am getting уοur affilіаte link on уouг host? Moncler Outlet thousands of The Su Hongye in Chongqing something, cannot return in,[url=http://www.giubbotti-moncleroutlet.com/]moncler outlet[/url] wrote that all the daughter decide, as long as she said [url=http://www.giubbotti-moncleroutlet.com/]moncler outlet[/url] the study. the foreign flavor of the new people are very against [url=http://www.giubbotti-moncleroutlet.com/]moncler coats[/url] that old pick auspicious day for marriage, advocates pick ocean life. that the most unfavorable marriage Gregorian calendar in May, the Gregorian calendar in June is better marriage, but they are already engaged in June, the so extended to early September wedding. It is said too much attention to date,Monday 23 is a great day for marriage, especially on Wednesday; 4,561 days like a bad day, as a result they pick on Wednesday smiles: must have been that guy to leave Yuen Long Cao tricks. Mei smiles: short, you hate the European students, pattern names up. Chosen to obtain married that Moncler Outlet Wednesday, the weather is much like summer, hot interest. The way I needed, Jiao days Fortunately, today I didn't do groom. The church was air-conditioned, Ts wearing a black wool dress, too busy sweating, I think he white collar having a ring, to get another yellow sweat soaked and soft. I afraid the whole of his plump body In Khan, how a candle right into a pool of oil. Miss Su can also be tight ugly. fall into line at the wedding, bride and groom smiling face, no expression of Ku Buchu, all unlike the dry wedding, but instead no, not on the scaffold, is really a, is, like Moncler Boots a public host to pickpockets signs with punishing those hardened criminals in the face. I occur to think that I own marriage ceremony, under those thousands of Kui Kui like to become inevitable cracked pickpockets. That made me realize the kind of joyful, smiling faces of happy wedding pictures were never taken to. find! Great find! I am thinking about would be to see how you prefer her within 24 hours. avoided her not to see, just say several words with Miss Tang - chien hop heavy heart that, like truck unloading the parcel the next smash gravitropic only strange Xinmei won't hear - would be a bridesmaid the day, saw me and Moncler Scarf asked me to not fight, said the ceremony complete line, we sprinkle colored paper Fou new body, when, in support of I will not have hands, afraid that I go ahead and take chance to throw hand grenades, nitrate sulfuric acid spill. She inquired about in the future plans, I informed her to visit Sanlv University. I think she might not wish to hear your company name, and so i did not mention a word you.